Imagery date refers to Google Earth capture of land forms. Ice extent is for August 30, 2016 from MASIE. Click to zoom in. The tracking shows Northabout is struggling with some heavy seas and making slow progress toward her next port Tuktoyaktuk NWT Canada. Beluga whales rolling on a sandbar — Coningham Bay. This was the scene at Coningham Bay, a shallow, broad bay with a shoal or sandbar extending across much of the entrance, protecting the waters inside. We were anchored just outside of the sheltered sub-bay. 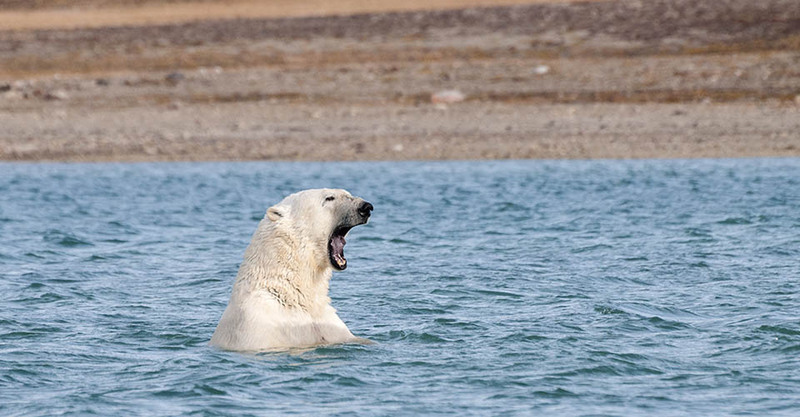 From the very start, we had occasionally been seeing polar bears in the water, on shore and wandering the low hills. Polar bears are typically solitary, so during the summer months the only occasion on which you are likely to see more than one at a time is when there are a mother and cub. Bears also typically hunt from the ice edge, so their being there on a quiet bay with no ice in sight was unusual, too. Something very special was going on. Imagery date refers to Google Earth capture of land forms. Ice extent is for August 29, 2016 from MASIE. Click to zoom in. Today the tracking shows Northabout is east of Barrow Alaska, having completed the North East Passage, and heading for NWP. 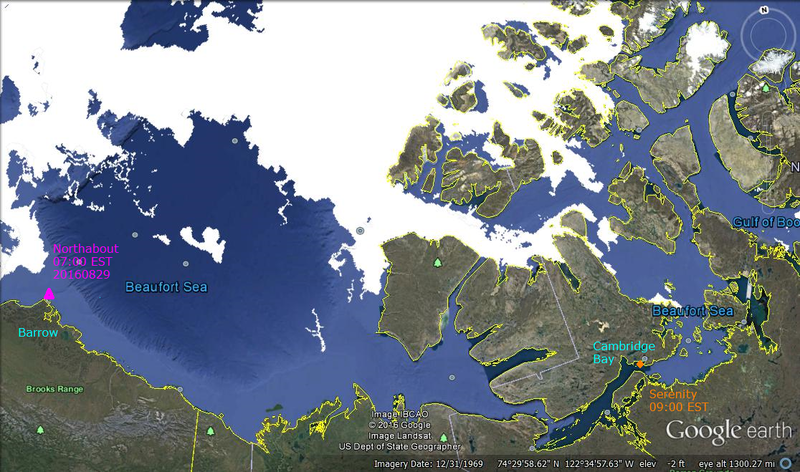 Serenity is ahead of them, having left port at Cambridge Bay Nunavut and presently in the Victoria Strait. The cruise tracker has 3 passenger ships in that area. 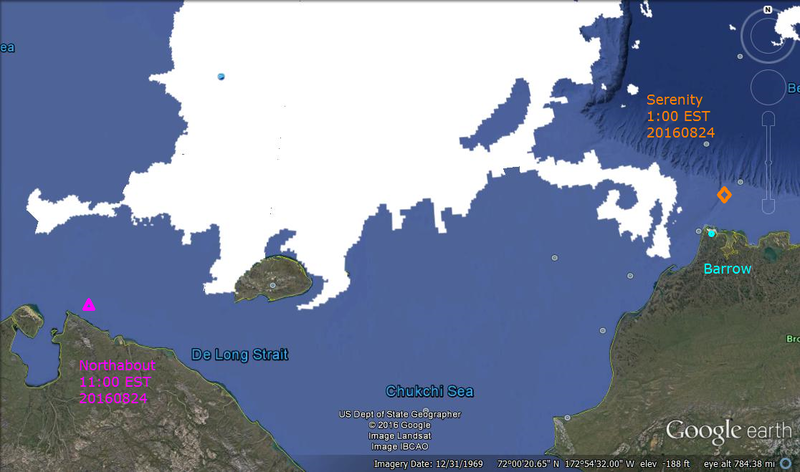 Given that Serenity’s next scheduled port is Pond Inlet in Baffin Bay on Sept. 4, I’m guessing Serenity is the one in McClintock channel positioned for a visit to nearby Taloyoak. 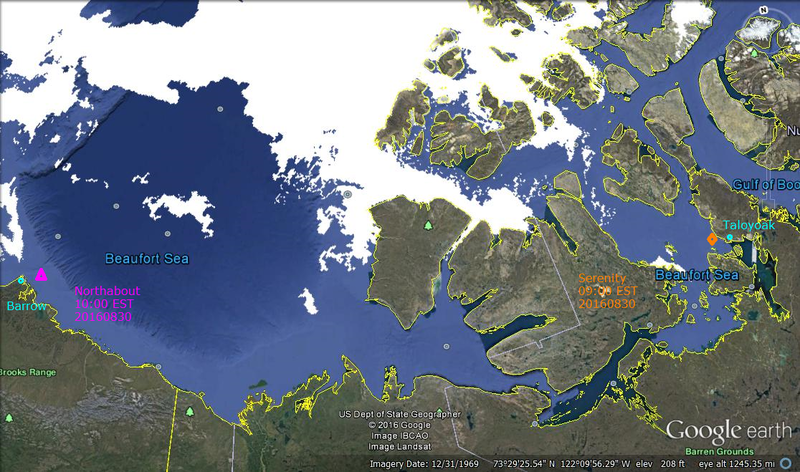 Taloyoak (population 850) is located on the southwestern coast of Boothia Peninsula at the Northwest Passage. 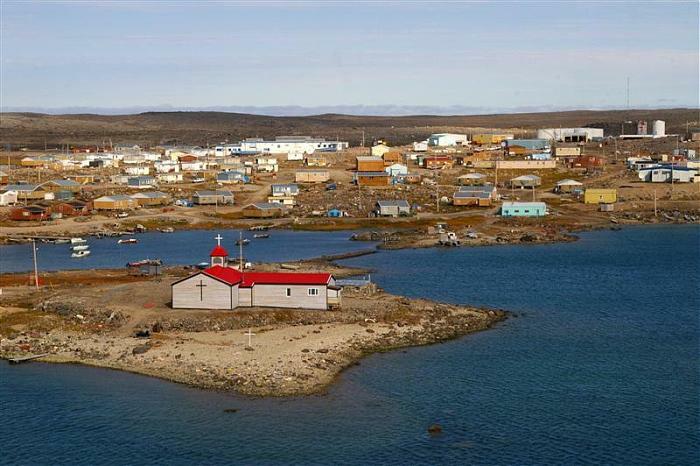 It is the northernmost community on Canada’s mainland. Taloyoak enjoys constant 24-hour sunshine from May 17 to July 27. The sea ice usually breaks up in June. Summer temperatures range from 5°C to 20°C. The snow begins to fall in late September or early October. Winter days have four hours of daylight and temperatures that range from -15°C to -35°C. With winter wind chill it can feel like -50°C. The local people are Netsilik Inuit descendants of the ancient Thule culture. The hamlet name of ‘Taloyoak’ means ‘large caribou hunting blind’ in Inuktitut. These screens were built with piled stones along the caribou migration routes. Muskoxen are also found near here and the fishing is some of the best in Nunavut. The Netsilingmiut women of Taloyoak have distinctive clothing. Their amautiit (traditional parkas) are often brilliantly coloured, fringed and beaded, plus they are famous for their handmade ‘packing dolls,’ which are very popular. Artistically unique Taloyoak carvings made from stone, whalebone, caribou antler and walrus ivory frequently depict mystical subjects of ancient Inuit legend. The man in charge of Serenity, Capt. Birger Vorland, has spent 38 years at sea. Vorland, who is originally from Norway, says the Northwest Passage has special meaning. The official record of transits through the North West Passage is kept at the Scott Polar Research Institute (here). The listing begins with that first transit by Amundsen and provides details of the 236 crossings recorded through 2015. 13 ships passed through the NWP last year, and the highest number was 29 in 2013. Cambridge Bay is partway through the NWP and will be home for the new Canadian High Arctic Research Station, pictured in the foreground above. 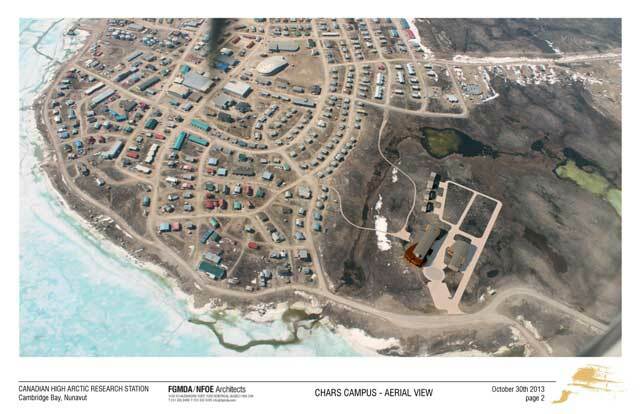 The CHARS campus is expected to be operational in July of 2017 and fully complete by March of 2018. The image also shows that the southern route through the Archipelago is mostly open water at this time, and the outlook is good for both Serenity and Northabout to achieve their itineraries. 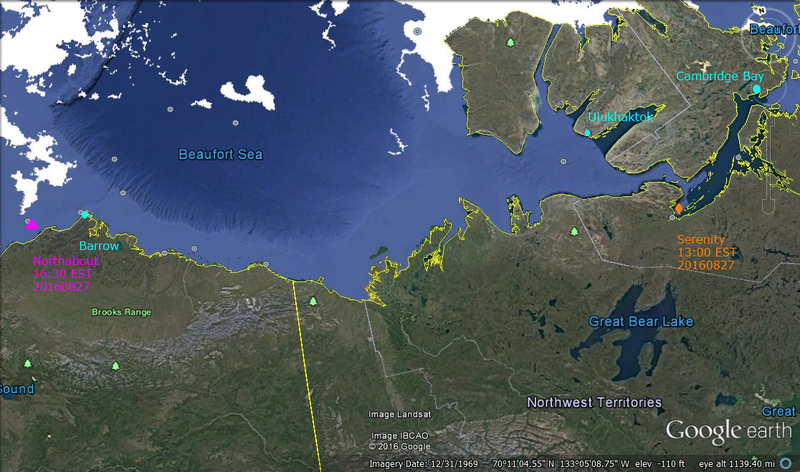 The most interesting section of the Nunavut gauntlet lies in Victoria Strait and McClintock channel. Arctic ice extents are declining as usual approaching the last 2-3 weeks of the annual melt season. Estimates are fluctuating a lot due both to drift ice moving around, and also the difficulty of measuring under cloudy and darkening conditions. The after effects of the recent sizable Arctic cyclone appear in the chart below. The table below compares 2015 and 2016 at day 240. This year is slightly lower, largely due to Beaufort Sea. Losses elsewhere in Baffin Bay, Greenland Sea, Hudson Bay and E. Siberian are more than offset by surpluses in Chukchi, Laptev and Central Arctic. Note that several seas that are down provide more open water for the ships exploring NWP this year. Presently 2016 ice decline is running 3 days ahead of 2015. 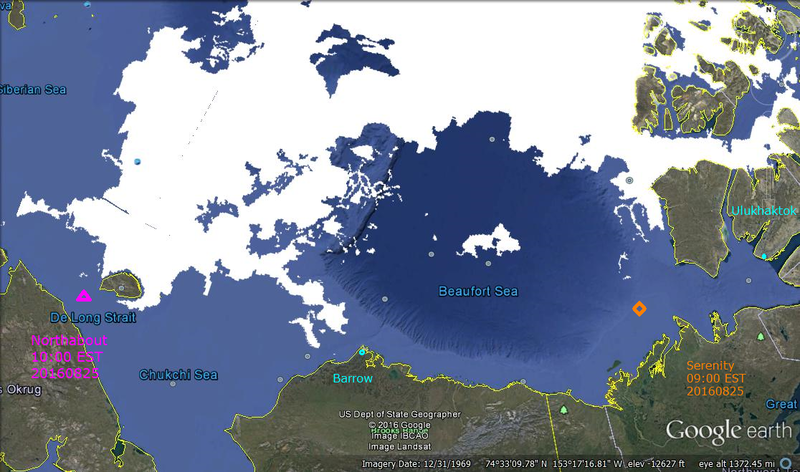 For more context on Arctic ice extent see Arctic Ice Watch July 31. For background on Polar Ocean Challenge see Laptev Wall and Nunavut Gauntlet. 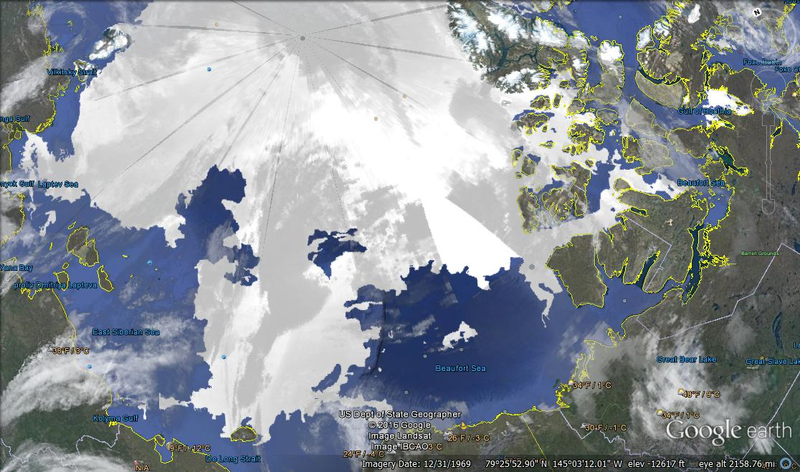 For those who wish to browse Arctic ice in Google Earth, the procedure is simple. Go to MASIE homepage and download the kmz file. Clicking on the file should open it in Google Earth (presuming it is on your computer.) Then you can browse, zoom in and out, and take images. I was once told by a fellow cruise passenger not to call our ship a boat. He said in the Navy they knew if you were in a boat it meant something awful had happened to your ship. Contrary to what many NDP supporters, and many of my colleagues believe, businesses are more likely to respond to government policies than to set them. One of the responses to egregiously irresponsible policies is to invest elsewhere. The Birn report did not discuss the scientific premises of anthropogenic climate warming, nor the prudence of attempting to regulate GHG emissions. 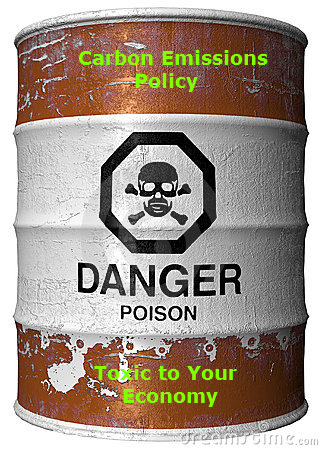 What matters are the consequences of policy choices by Canadian and U.S. governments for Alberta and Saskatchewan. The interdependence of North American economies and the familiar 10-to-one ratio between the two countries means that Canada must always adjust its policies to American realities. That ratio applies to global CO2 emissions (16 per cent for the U.S.; 1.7 per cent for Canada, of which the oilsands’ contribution is minuscule) as well as to GDP and much else. Canadian CO2 emissions are comparable to those of Texas. The big difference is how that CO2 is generated. Coal is the largest source of American CO2, mostly from electricity generation, followed by transportation and industry. In Canada, industry — from fertilizer manufacturing to mining, smelting and pulp production — is the largest emitter, followed by transportation and then electricity generation. The main reason for this difference is that in B.C. and Laurentian Canada, hydroelectricity is the chief source of power. Prairie rivers furnish great fishing opportunities, but few electrons. Since CO2 from American coal plants alone are double those from the entire Canadian economy, they have been the focus of U.S. policies. Replacing coal-generation with natural gas has been made easier by low natural gas prices, partly the result of innovative shale-gas exploitation. In Canada, things are different. Because more than 80 per cent of Canadian electricity is generated by non-emitting sources, other sectors must be targeted to achieve levels of emission reductions comparable to the Americans’. The cost, however, is bound to be higher: here, cheap gas hardly matters. This is what makes carbon taxes so attractive to Canadian governments. They can’t go after coal plants, because there are so few left, so they go after the entire economy. Alberta’s carbon tax and Ontario’s cap-and-trade policy mean that over two-thirds of Canadian emissions will be covered by next year. Big-government Liberals, socialists and members of the green cult will rejoice that we are saving the planet. However, the costs of the new NEP — the national emissions policy — achieved by carbon-tax harmonization, will introduce more incentives for investment in places where anthropogenic climate change is not an unquestioned public policy dogma. Because the Prairie petroleum industry competes globally for both capital and markets, parochial Canadian climate policies add to costs and induce investors abroad. And they make no difference at all to global GHG emissions. That is one reason why energy investment in Alberta is half 2014 levels. No wonder Finance Minister Joe Ceci is sad. The consequences of his own policies are bearing their inevitably poisoned fruit. Barry Cooper is a professor of political science at the University of Calgary. Former Canadian PM Stephen Harper (from Alberta) based his climate change policy on the realities mentioned in the article. His administration was committed to matching US energy policies on a sector by sector basis. Since the US went after coal, so did Canada. The US has not done anything about oil and gas, so neither should Canada. The ruling NDP party are on thin ice because Albertans are mostly skeptical of global warming claims. A recent Canadian survey shows the % of people whose beliefs would support what the administration is doing. That’s right: Alberta is the dark blue province in the map. Imagery date refers to Google Earth capture of land forms. Ice extent is for August 27, 2016 from MASIE. Click to zoom in. Today the tracking shows Northabout is in port at Barrow Alaska, having completed the North East Passage,and preparing for NWP. 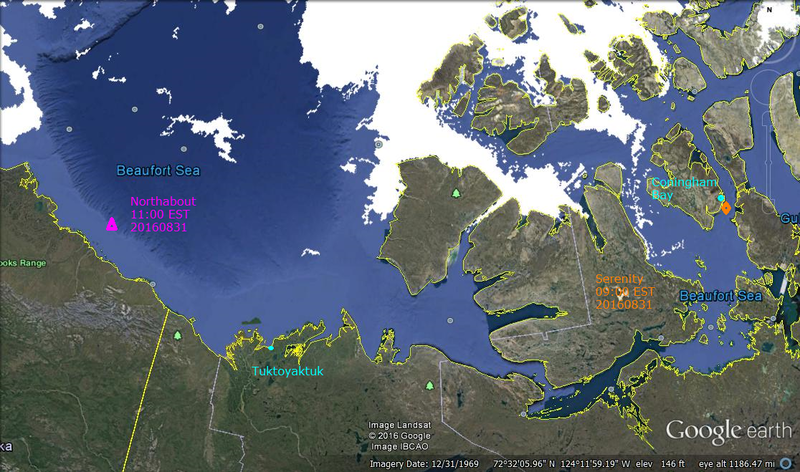 Serenity is ahead of them, soon to be in port at Cambridge Bay Nunavut. The image also shows that the southern route through the Archipelago is mostly open water at this time, and the outlook is good for both Serenity and Northabout to achieve their itineraries. The most interesting section of the Nunavut gauntlet lie just ahead of Serenity’s position. Those pesky Australian alarmists sure do like to exaggerate. First they sold everyone that the “Science is Settled. Fossil fuels are warming the planet dangerously.” The government said: “We accept your report, thank you for your service,” and followed up with a plan to downsize the climate research unit (CSIRO). Then came their loud public outcry: “You can’t do that. There is so much we don’t know and have to study. We need those jobs.” So the government walked back that plan. Now Australian scientists figure to build on their success by writing an open letter to the Prime Minister urging action to “fight climate change.” And, no surprise, Exhibit A is the threat to the Great Barrier Reef. Trouble is, once again they are exaggerating and hoping no one will notice. The bluff is being called by people who visit and dive the reefs every day. New research found about 68 per cent of reefs from Cairns to Lizard Island had varying levels of coral bleaching, but most of it likened to sunburn on a human body where the coral glows pink before fully recovering. Latest findings by the Reef and Rainforest Research Centre give hope about the resilience of the living wonder after scientists this week revealed 93 per cent of the 2300km-long reef system was in the grip of a mass bleaching event. Great Barrier Reef as seen by Activists. (Later Greenpeace admitted the image is a storm-damaged reef in the Philippines). Coral bleaching is linked to high water temperatures of the latest El Niño weather system, where stressed coral polyps eject their photosynthetic zooxanthellae and, in extreme cases, the living colony will appear totally white. Skeletons are covered in algae. Great Barrier Reef photographed by Ronald Hanko June 16, 2016. Great Barrier Reef tourist operators found less than 5 percent of the natural wonder has died off from “bleaching,” despite claims from scientists that most of the reef had been killed off by the effects of global warming. “Scientists had written off that entire northern section as a complete white-out,’’ Chris Eade, owner of the diving boat Spirit Of Freedom, told The Courier-Mail in an interview. “It wasn’t until we got underwater that we could get a true picture of what percentage of reef was bleached,’’ Craig Stephens, who manages Mike Ball Dive Expeditions, told The Courier-Mail. Stephens has surveyed the reef and compared his findings to a similar survey he did 20 years ago. He found almost no change between what he saw back then and today. “Coral mortality in the outer shelf reefs north of Lizard Island was between one and five per cent,” according to findings exclusively obtained by The Courier-Mail. This stands in sharp contrast to reports from April of 50 percent bleaching in the northern section of the reef. “The discrepancy is phenomenal. It is so wrong. Everywhere we have been we have found healthy reefs,” Stephens said. Down under the alarmist icon is the Great Barrier Reef. In the North of course, it is the Arctic Polar Bear. Imagery date refers to Google Earth capture of land forms. Ice extent is for August 26, 2016 from MASIE. Click to zoom in. Cruise liner Serenity spent yesterday at Ulukhaktok and is at sea today, apparently paying a visit to the Kugluktuk waterfall just inside Nunavut. I say apparently because the ship is not identified by name but there is nowhere else she could be on the way to her next port, Cambridge Bay. Kugluktuk is the westernmost community in Nunavut. It is located north of the Arctic Circle on the Canadian mainland at the mouth of the Coppermine River where it feeds into Coronation Gulf, which is part of the Northwest Passage. Situated near the border with the Northwest Territories, the scenic valley of the Coppermine River was an ancient source of copper for the Inuit people. It has a unique microclimate that extends a narrow band of stunted boreal forest trees northwards toward the Arctic Ocean. Kugluktuk enjoys constant 24-hour sunshine from May 27 to July 17. The average temperature in Kugluktuk is the warmest in Nunavut, sometimes rising to 30°C in the summer. Winter temperatures range from -15°C to -40°C. ‘Kugluktuk’ means ‘place of moving water’ and the root word ‘kugluk’ means ‘waterfall.’ Upriver from this hospitable hamlet is the beautiful Kugluk cascade, also known as Bloody Falls, an ancient fishing and hunting location that is now a territorial park of historic cultural importance. Meanwhile Northabout has made good progress and is approaching Barrow, Alaska, making her way between some ice and the shoreline. The bigger picture below shows that the southern route through the Archipelago is mostly open water at this time, and the outlook is good for both Serenity and Northabout to achieve their itineraries. A humorous look at why the global warming campaign and the triumphal Paris COP make sense. Yes Minister explains it all in an episode from 2013. This is an all-too-realistic portrayal of political climatism today. Yesterday I realized that BBC had blocked the viewing of the video. So I sought and found the subtitles for Yes Prime Minister 2013, Episode 6, “A Tsar is Born”. That final episode for the series began with the dialogue in yesterday’s post Climate Alarms LOL. Today I provide the dialogue that formed the episode conclusion, and which was the content of the blocked video. Humphrey I have returned with the answer to all your problems. Jim I thought you were against it? Humphrey Everybody’s against it, Prime Minister. I suddenly realised that is the beauty of it. imaginary problem than a real one. Jim You believe it’s real? Humphrey Do you? I don’t know. Jim Neither do I. Haven’t got the faintest idea! Humphrey But it doesn’t matter what we think. If everyone else thinks it’s real, they’ll all want to stop it. So long as it doesn’t cost too much. So the question now is, what are we going to do about it? Jim But if it isn’t happening, what can we do about it? Humphrey Oh, there’s so much we can do, Prime Minister. We can make massive investments in wind turbines. We can, in fact, Prime Minister, under your leadership, agree to save the world. Jim Well, I like that! But Russia, India, China, Brazil, they’ll never cooperate. Humphrey They don’t have to. We simply ask them to review their emissions policy. Humphrey Yes. And then they’ll decide not to change it. So we’ll set up a series of international conferences. Meanwhile, Prime Minister, you can talk about the future of the planet. Humphrey You can look statesmanlike. And it’ll be 50 years before anybody can possibly prove you’re wrong. And you can explain away anything you said before by saying the computer models were flawed. Jim The voters will love me! Humphrey You’ll have more government expenditure. Jim Yes. How will we pay for it? We’re broke. but we phase in the actual expenditure gradually. Say, over 50 years? That will get us out of the hole for now. Bernard The Germans will be pleased. They have a big green movement. Claire And we can even get the progs on board! Bernard As long as they get more benefits than everyone else. Jim My broadcast is on Sunday morning. Humphrey You have a day to get the conference to agree. Jim That’s not a problem. Nothing will have actually been achieved. Humphrey It will sound as though it has. So people will think it has. Bernard Oh, magnificent, Prime Minister! but the cabinet will have been pretty surprised. We’ll have to square them fast. Humphrey We’re not there yet. After that interview, you’ll need to announce some pretty impressive action. Jim Do we have enough in the kitty? but never actually spend the money. Jim Great. Like the one on child poverty. Bernard Maybe it should be a government committee? Jim Well what about a Royal Commission? on it, they’ll never agree about anything important. Jim Right! A Royal Commission! it’s important but not urgent. Claire Well, what about a Global Warming Tsar? Jim Fine! Would that do it? Humphrey No, I think it might need a bit more than that, Prime Minister. to show how much importance you place upon him. Jim No problem. Who would it be? Humphrey Ah, well, it can’t be a political figure. That would be too divisive. It has to be somebody impartial. Jim You mean a judge? Humphrey No, somebody from the real world. to drive the engine of government. Jim That’s quite a tall order. We skeptics enjoyed immensely the expert satire of Yes Prime Minister directed at the foibles of climate hysteria. That clip was available at my post Laughing at Climate Change. (That video is also now blocked, but I have added the transcript (here). Now we find there was another even more skewering into the soft underbelly of the beast. H/T Global Warming Policy Foundation (here). The phone rings. They all look at it. Claire Hello? It’s the BBC again. I see. Thanks. (She hangs up.) Piling on the agony. A big new story about global warming has just broken, they’re adding that to the Sunday programme too. Global warming computer models have been proved wrong. Claire The new models show that it’s even worse than previously thought. Much more severe. And happening faster. Jim Is that supposed to be my fault too? Claire Everything is at the moment. They want to know why the government is dragging its feet on CO2 emission controls. Jim (losing it) Do we have to deal with that tonight? As well as …(much has gone wrong for Jim earlier in the play)… Is there anything else, anything else we can pile on me tonight? Oh yes! Global bloody warming, thank you very much! Claire It’s just that they’re going to add it to the catalogue of your failures. (He gives her a look.) Alleged failures, I mean. Humphrey Meanwhile, may I suggest that you don’t worry too much about global warming? Jim Right. I can’t do anything about that tonight, can I? Humphrey Tell me, how do they know we’re all going to drown in years when the weather forecast was so wrong last Friday? Jim Because all the scientists agree. Humphrey So they say. So do the computer models. I know. But why should global warming computer models be any more accurate than financial ones? Humphrey Wall Street computer models were designed to prove sub­prime mortgage derivatives were low risk. These computer models are designed to show global warming is getting worse. Jim Come off it, Humphrey. Humphrey Remember mad cow disease? Computer models for that proved that we’d be dying in our hundreds of thousands by now. The only thing is, virtually nobody died, did they? Same with the salmonella-in-eggs computer models. Same with swine flu. Jim You’re suggesting … what, exactly? Jim What other causes are there? Jim If? The world is getting hotter, the science is overwhelming, everyone knows that. Humphrey There’s been no rise in temperature since 1998. Jim Really? But it was rising, wasn’t it? Humphrey From 1975 to 1998, yes, absolutely. Jim That’s what I mean. Humphrey But it fell from 1940 to 1975. Even though that was a heavily industrialised period, when CO2 shot up. And overall the temperature isn’t rising at all: the hottest year in the twentieth century was 1934. Jim I read that two thousand five hundred top climate scientists contributed to the last IPCC survey and they all agreed that man­made global warming is a proven fact and trapped greenhouse gases are the cause. Humphrey Nearly fifty of them agreed. The others didn’t, actually. But their views were left out of the summaries given to the press. Claire Haven’t you seen that film of the melting icebergs in the Antarctic? Humphrey Yes. Beautiful, aren’t they? Claire That’s caused by CO2. Humphrey No, that’s caused by warm water masses from the Pacific. Claire Why are the polar bears becoming extinct? Claire The computer models say they are. Humphrey But the people who actually go and count them have found more than there were thirty years ago. Jim For heaven’s sake, Humphrey! If it’s all such nonsense why does everyone believe it? Humphrey (amused) Hard to understand, I agree. But some scientists believe it, lots of others want the billions of pounds you can get for research that seems to show that global warming is caused by greenhouse gases, and most of the scientists who disagree can’t get published. Journalists love shock­horror stories, governments want to look virtuous to the voters, lefties want a way to rubbish big oil, and it makes the tree-huggers, whale-savers, anti-capitalists and everyone at the BBC feel holier than thou and warm and fuzzy inside. What’s not to like? Jim Why hasn’t anyone else said all this? Humphrey They have. No one wants to hear it. Jim So wind farms don’t make sense? Humphrey (chuckles) They certainly do, for all the businessmen who are getting enormous government grants for them. But there isn’t enough wind to be practical. The total output of all the UK wind turbines put together is one-fifth of one decent sized coal-fired power station. Claire You don’t believe in global warming? Humphrey My job is not to believe or disbelieve. My job is to weigh up arguments and produce answers. That’s what the Civil Service is for. Jim I really think you must be misinformed somewhere. Al Gore got the Nobel Peace Prize for his work on global Warming. Humphrey So did Dr Kissinger for his work on the Vietnam War. Jim has no answer to that. Jim You think it’s all a scam? I can’t get my head around this. Humphrey For some people it’s a scam. For most, it’s just the greatest outbreak of collective hysteria since the witchcraft trials in the seventeenth century. Opposition’s about asking all the questions. And government is about not answering them. The less you intend to do about something, the more you have to keep talking about it. “Open government” is a contradiction in terms. You can be open or you can have government. Citizens don’t have a right to know, theirs is a right to be ignorant. Knowledge only means complicity and guilt, ignorance has a certain dignity. If people don’t know what you’re doing, they don’t know what you are doing wrong. “Under consideration” means we’ve lost the file. “Under active consideration” means we’re trying to find it. Cruise liner Serenity is nearing its first port of call in the Northwest Passage just outside Nunavut. Ulu cutting tool made of steel with whale bone handle. The place name comes from a time when these tools were made of sharpened slate, apparently plentiful in the area. The ULU (OO-loo) is an extremely versatile cutting tool crafted by the Native Alaskan people over five thousand years ago. The knife was primarily used by Inuit women for skinning and cleaning fish and has played an important role in the survival of the Arctic people. Blades were originally made of polished slate and given a bone, ivory or wood handle. The handles were often inscribed with distinctive designs or markings exclusive to the maker of the knife. Today, Inuit and people from all walks of life continue to use the versatile ULU as their primary cutting tool, despite the wide availability of other knife designs. Because the center of force is concentrated directly over the middle of the blade, it creates twice the direct downward force compared to that of conventional cutlery (where the force is behind the center of the blade). Today’s MASIE ice chart shows ice extent hovering around 5M km2 following the recent cyclone with variability mostly in BCE region (Beaufort, Chukchi, E. Siberian seas). This happens to be the location of two ships exploring the ice extent: Northabout (Polar Ocean Challenge) and Serenity (Celebrity Cruiseliner). Imagery date refers to Google Earth capture of land forms. Ice edges are August 24, 2016 from MASIE. Click to zoom in. 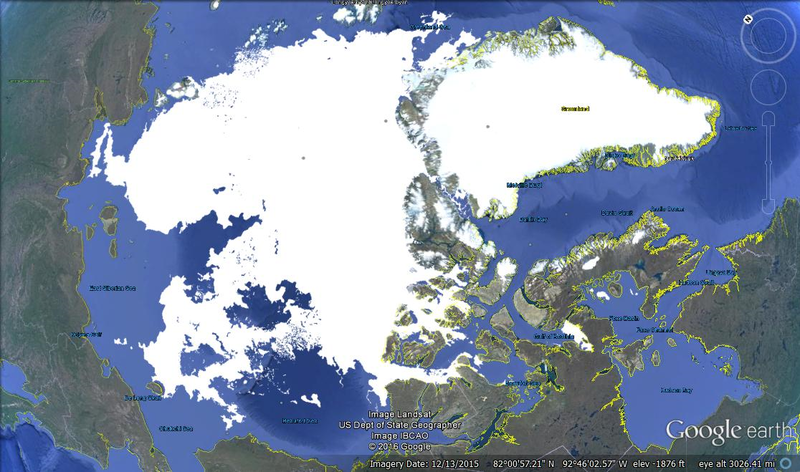 As the image shows, Northabout has passed the ice tongue but has to go further south before proceeding longitudinally. Serenity negotiated an icy area, before passing Barrow and soon approaching Ulukhaktok. The bigger picture below shows that the southern route through the Archipelago is open at this time, but that can change in the days to come. The Arctic Cyclone operating near the north pole has compressed the ice extents, The graph below shows the results: Overall ice extent which had recently stabilized lost 924k km2 in just 5 days. 472k km2 was lost in BCE (Beaufort, Chukchi and East Siberian seas) and another 139k km2 in CAA (Canadian Arctic Archipelago). In the last 2 days MASIE shows an overall recovery of 323k km2, with 216k m2 in the BCE region. The graph below shows the indices converging. Today’s MASIE ice chart shows more recovery of ice extent following the recent cyclone, mostly in BCE region (Beaufort, Chukchi, E. Siberian seas). This happens to be the location of two ships exploring the ice extent: Northabout (Polar Ocean Challenge) and Serenity (Celebrity Cruiseliner). Imagery date refers to Google Earth capture of land forms. Ice edges are August 23, 2016 from MASIE. Click to zoom in. As the image shows, Northabout has passed the ice tongue and can proceed to cross longitudinally. Serenity has also passed through an icy area, now above Barrow with open water ahead. The bigger picture below shows that the southern route through the Archipelago is open at this time, but that can change in the days to come.